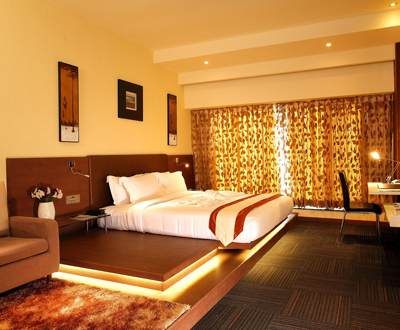 Located 100 meters from the Cochin International Airport, the Flora Airport Hotel Kochi is a conveniently placed 4­Star property and features modern rooms. The hotel is suitably connected to the highways, railway stations and close to the business district 'Kochi'.Flora Airport Hotel will be a perfect place for you to explore the beauty of Kochi. 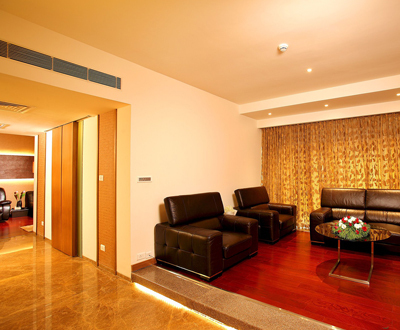 The hotel offers 60 centrally air­conditioned rooms and suites featuring modern interiors and furnishings. Each elegant room is ideal for the corporate travelers and families alike. The rooms are fitted with LCD Television with Satellite Channels, High Speed Wi­Fi Internet Connectivity, Work Desk, Direct Dial Telephone, Electronic Safe Deposit Box, well stocked Mini Refrigerator, Tea/Coffee Maker and En­Suite Bathroom. The rooms are classified into Deluxe King, Deluxe Twin, Executive Club Room, Business Suite, Flora Suite and Presidential Suite. The multi cuisine restaurant offers daily buffet breakfast, lunch and dinner that can seat 36 pax. Located at the lobby level and is open during the buffet timings. You can find here Indian, Chinese and Continental cuisines. It is a food court located within the hotel premises and caters with a choice of fast food including American Fried Chicken, Arabian Grills, Kebabs, Tikkas, Pizzas, Pastas and Burgers. This Mediterranean Restaurant located on the first floor serves a selection of favorite Arabic, and International Cuisine. Meeting facilities in the hotel includes 2 Boardrooms with video conferencing arrangements and state of the art equipments, Ideal for a perfect business meetings. The banquet hall has a capacity of 1200 pax with theme lighting and live internet streaming. The banquet rooms are classified into Dahlia, Maple, Mehfil­I and Mehfil – II. Meeting facilities in the hotel includes 2 Boardrooms with video conferencing arrangements and state of the art equipments, Ideal for a perfect business meetings. 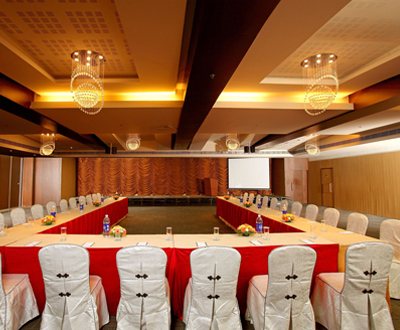 The banquet hall has a capacity of 1200 pax with theme lighting and live internet streaming. The banquet rooms are classified into Dahlia, Maple, Mehfil­I and Mehfil – II.Fitness and Recreation. II Floor, G 66, Elders Forum Road, Panampillynagar, Cochin.